The following images show The Leeds Waits at various events and venues since 2004. For more pictures, see our Facebook page. For pictures from the first two decades of our existence, see the picture archive. 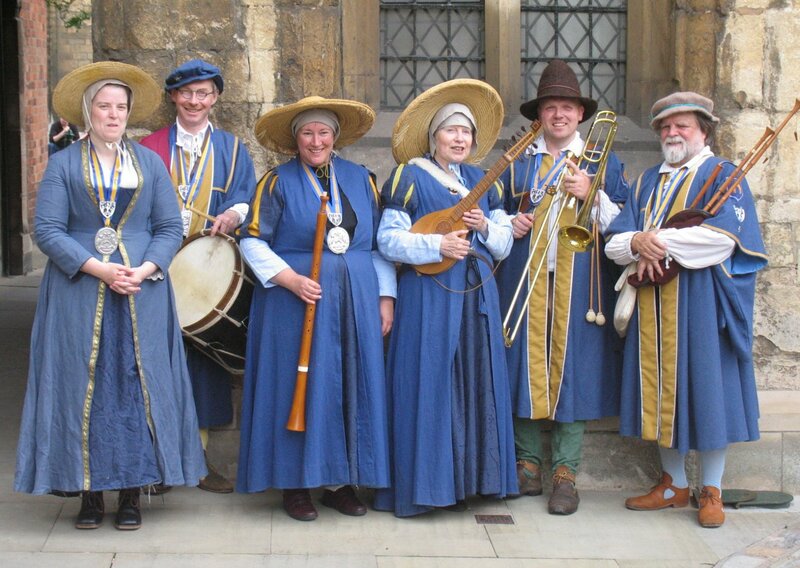 In 2004 we made our first trip abroad, to Den Bosch in The Netherlands for the First International Festival of Town Pipers. We played at a number of historic venues including the Zwanenbruidershuis. New members playing on that occasion were Caitlin and Derek Richardson, on cornett and tabor respectively. 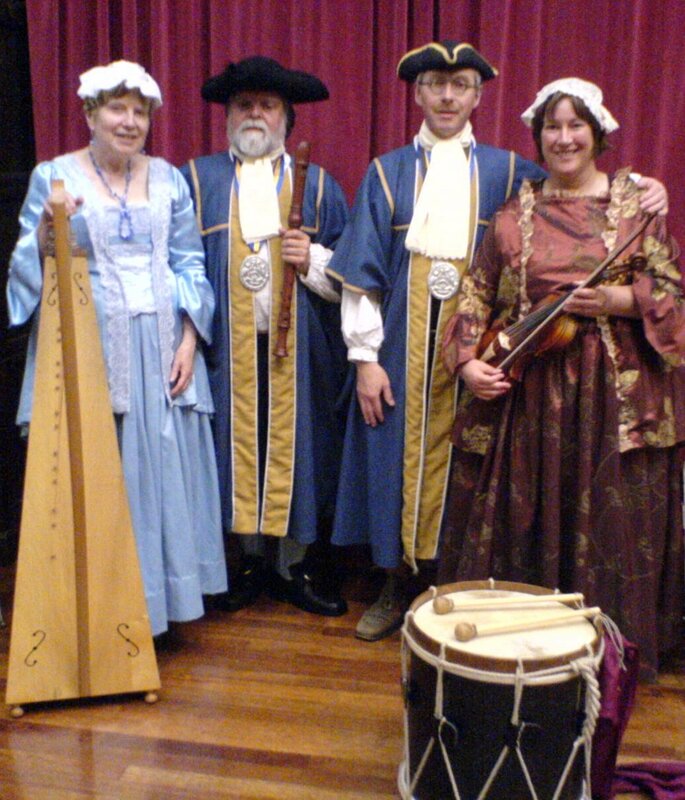 The other instruments are hurdy-gurdy and soprano and alto shawms. 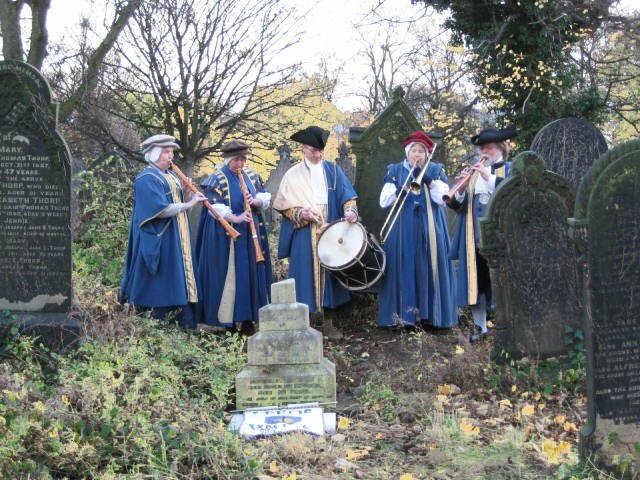 Also in 2004, we discovered the grave of Thomas Crawshaw, the last of the pre-1835 Leeds Waits, who died in 1858. 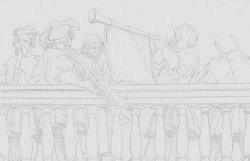 Although he died a pauper, according to a press report the local musicians gathered at the funeral and played at the graveside. Three of us went, on a bright but frosty November morning on the anniversary of his death, and played once more in his memory. It was a very moving occasion. 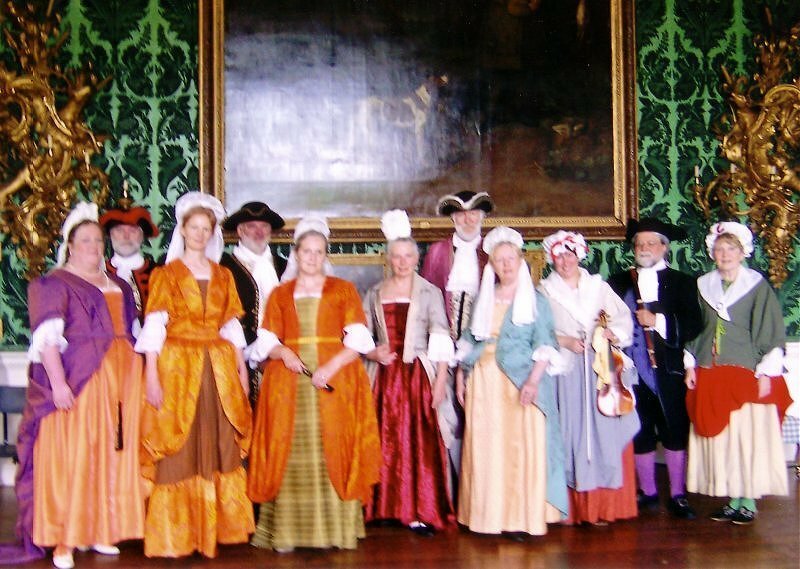 We marked the 300th anniversary of Marlborough's victory at Blenheim by recreating the celebration ball at Temple Newsam with the historical dance group "Greensleeves", with a trio of violin, baroque flute and triple harp. On official duty, escorting the Lord Mayor of Leeds at the Leeds International Medieval Congress. 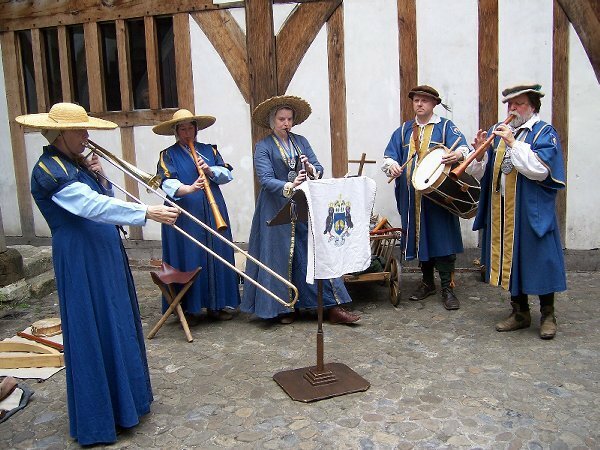 The Second International Festival of Town Pipers was held in York in 2006 in conjunction with the performance of the York Mystery Plays. 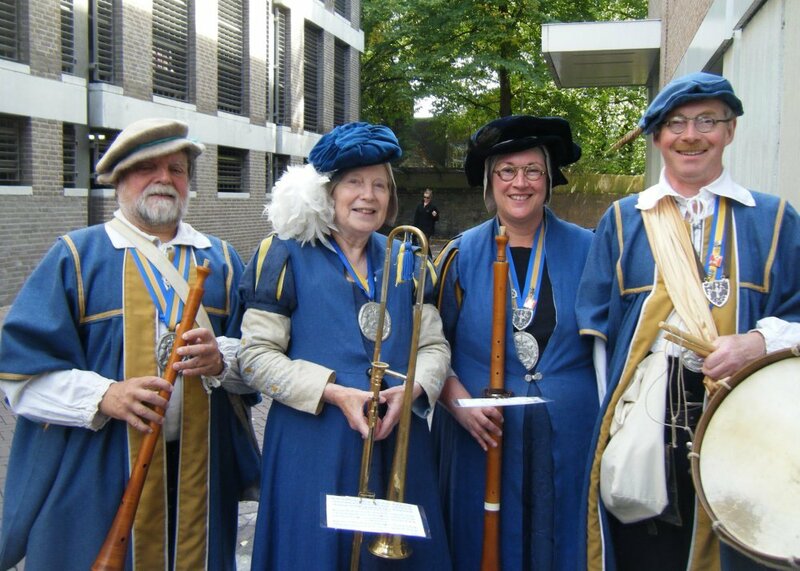 Here we are playing in St. Helen's Square, on sackbutt, shawm, cornett, tabor and curtal. Another picture from the festival in York, performing outside Barley Hall. Yet again in York, at Holy Trinity, Goodramgate on Heritage Days 2007, with Jonathan Ridy percussing. 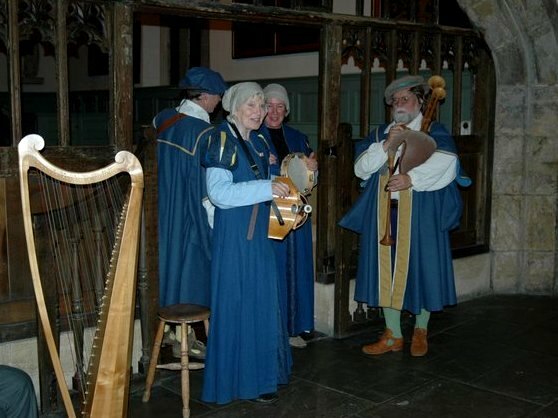 Entertaining in the undercroft for a reception and banquet at the Merchant Adventurers' Hall in York. 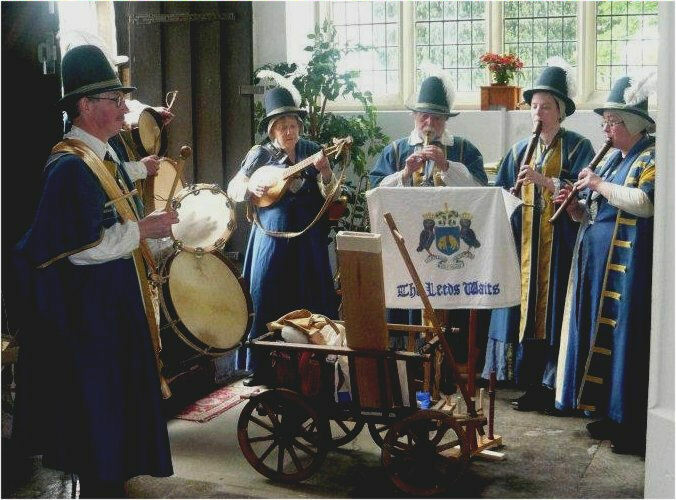 Here are three of our number performing for "Light Night" in October 2007, at the Church of St. John the Evangelist in Leeds city centre Note how superbly our livery colours blend with the colours of the altar. 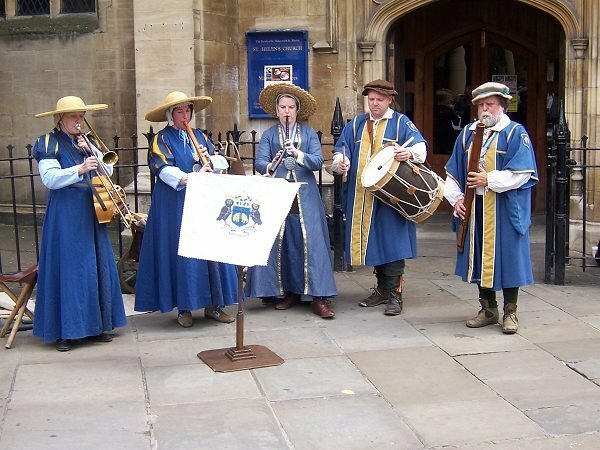 Here we are playing outside the Guildhall in Lincoln, at the Third International Festival of Town Pipers in June 2008, with Derek on his new bass sackbut. Although the historical waits were all male, the revived Leeds Waits is an equal opportunities "employer". 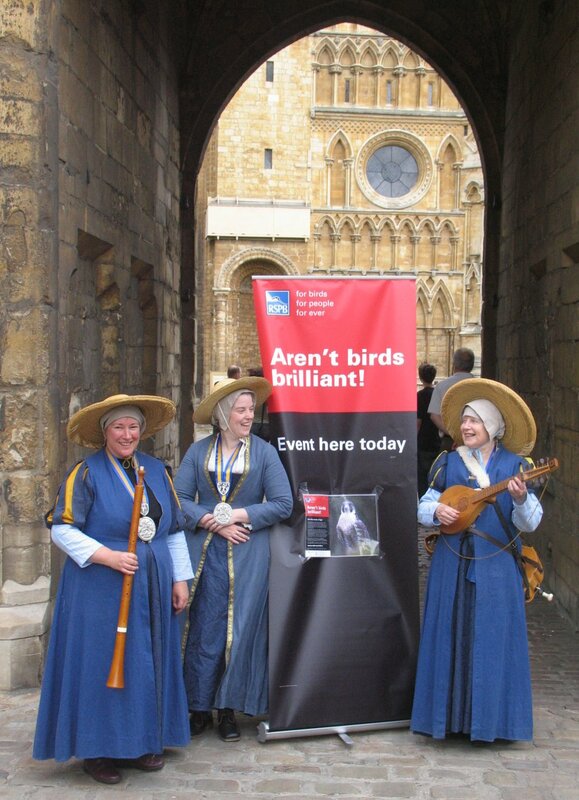 Conclusive evidence is provided by this picture taken at Exchequergate in Lincoln. 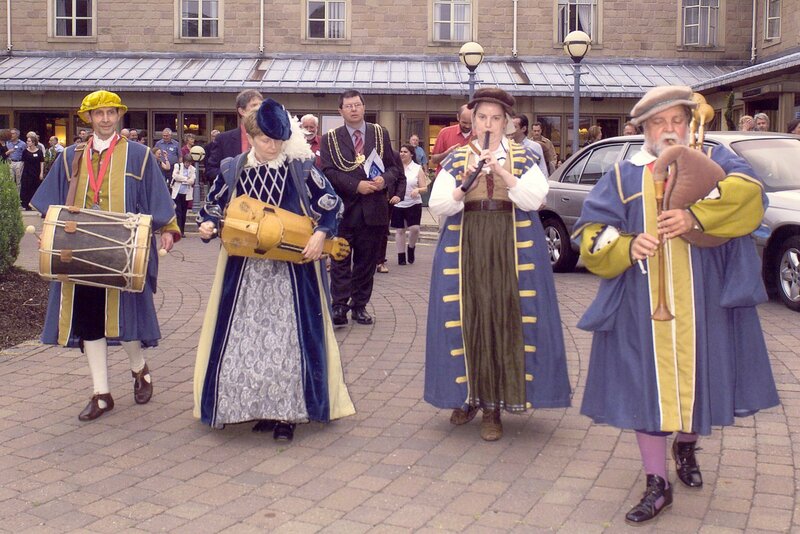 The White Rose Ball in 2008 was baroque, so a week after the Town Pipers' Festival we had moved on a century and a half in music, instrumentation and fashion. 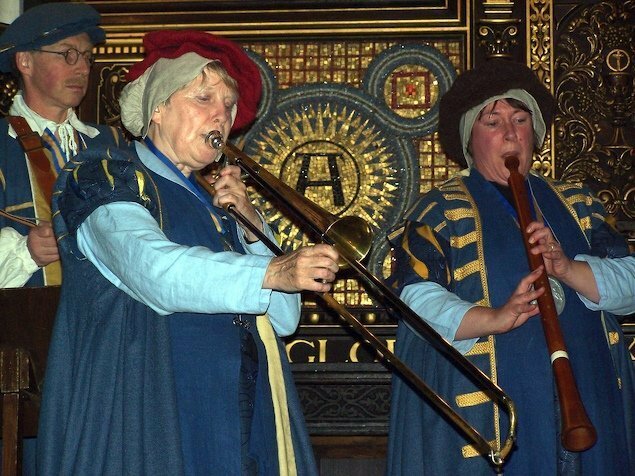 Back to the renaissance for Light Night 2008, playing from the first floor landing of the magnificent tiled double staircase at Leeds Central Library. 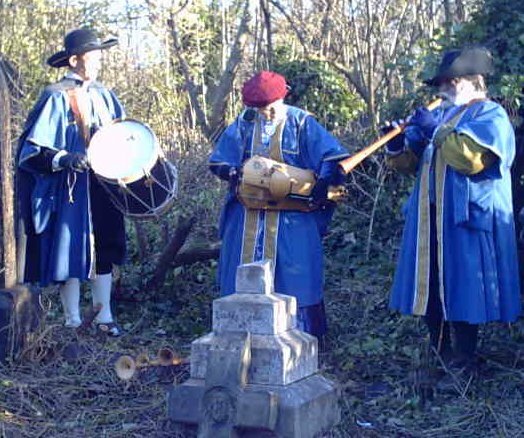 The Waits back at Beckett Street Cemetery in November 2008, visiting the grave of former wait Thomas Crawshaw to unveil a gravestone on the 150th anniversary of his death. 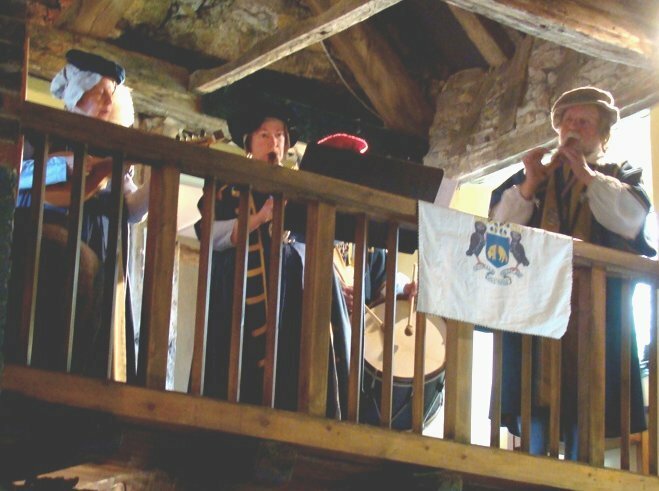 Playing from the minstrels' gallery in the 13th century great hall at Crook Hall, Durham. 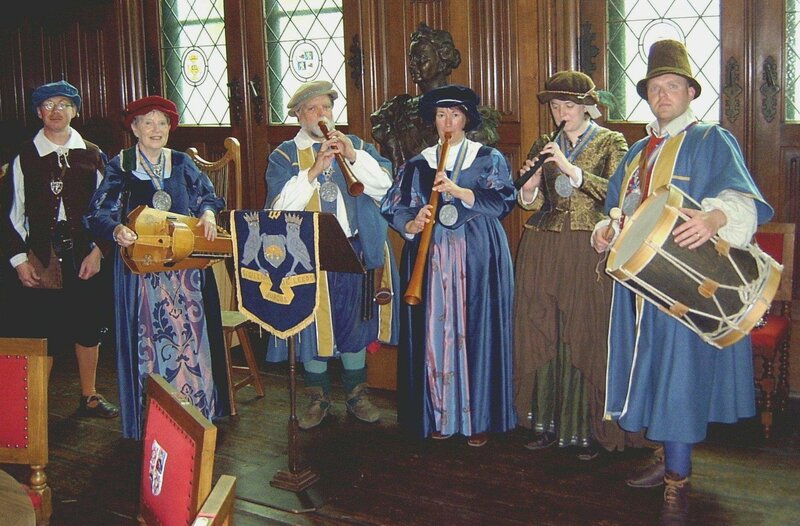 Performing at the Fourth International Festival of Town Pipers in 's-Hertogenbosch, The Netherlands in September 2010. At York Mystery Plays 2010, performing with the Gild of Butchers. 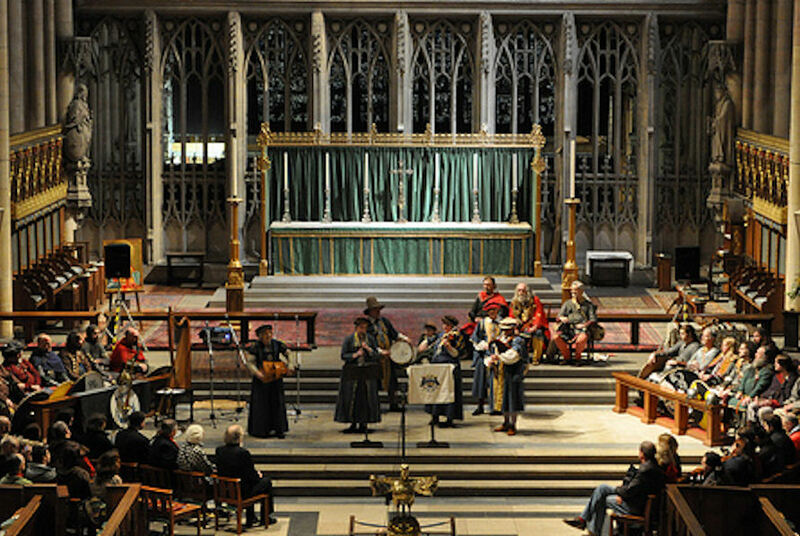 Performing in the Quire of York Minster in February 2011. 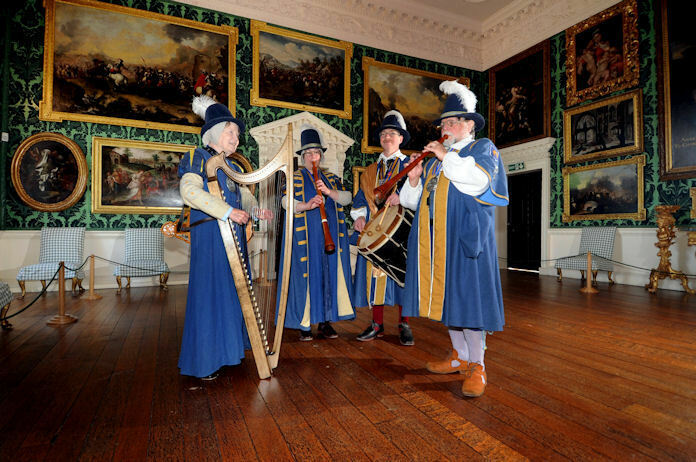 In the splendour of the Picture Gallery at Temple Newsam in April 2012 (Picture - courtesy of the Yorkshire Evening Post). 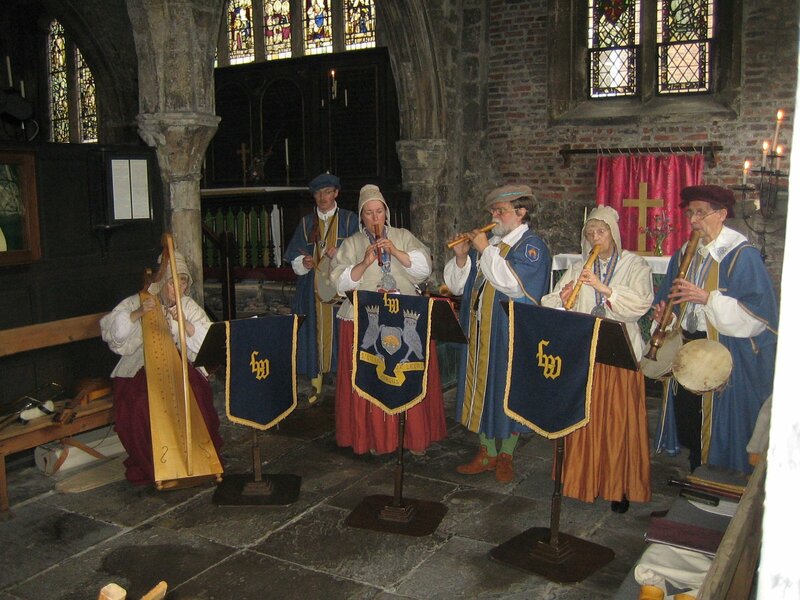 At the Fifth International Festival of Town Pipers in Colchester in 2012, performing at Holy Trinity Church. 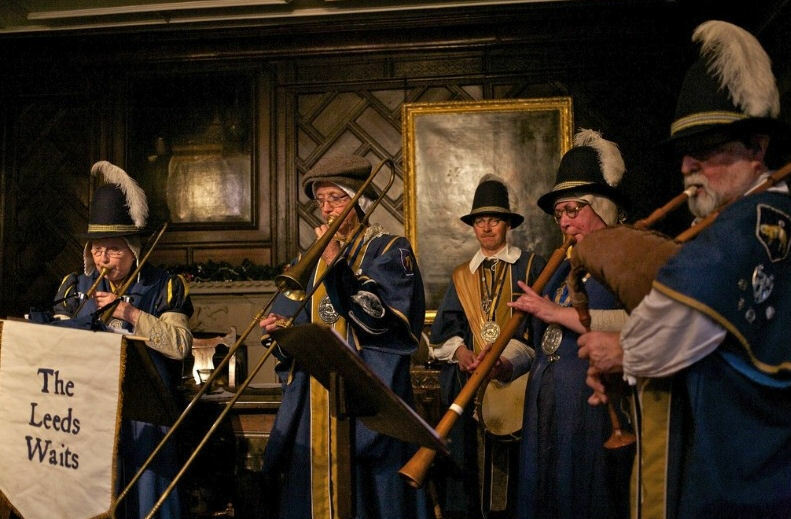 In the Jacobean dining room at Towneley Hall in Burnley, November 2013 (Picture - courtesy of Dave Beard).